It is often helpful for owners’ peace of mind to know what to expect when Dr. Kane comes to their home to perform an euthanasia. Prior to the appointment, a medical history will be obtained and questions regarding the euthanasia process will be discussed. Upon arrival at the home, Dr. Kane will examine the pet to become more familiar with his or her condition and specific needs. The owner or owner’s agent will be asked to sign consent forms for the procedure and special considerations or memorials the family would like to incorporate will be reviewed. Additional questions will be addressed at any time during appointment. Payment for services is taken before the euthanasia process begins so those present may focus on saying goodbye to their beloved companion. Gift of Goodbye performs euthanasia using the most humane methods available. The entire process involves two injections and usually takes 20-30 minutes. This time may vary, depending on individual animal response. The first injection is a combination of drugs administered under the skin or in the muscle to provide sedation and pain relief. Once the pet is well sedated, an IV catheter is placed in the front or hind leg for administration of the final injection. After those present have had the opportunity to say goodbye, the euthanasia drug is administered. If the pet is small and/or dehydrated, placement of a catheter may not be possible and the euthanasia agent will be carefully injected via direct access into the bloodstream. This drug acts to rapidly stops brain, heart and respiratory activity. The pet is unaware of what is happening and does not experience any anxiety, fear or pain. As the drug takes effect, the pet will quietly relax and his/her journey will come to a peaceful end. Some pets may exhibit muscle twitching or tremors and may even take a deep breath after they have passed on. These are reflexes and should not be misinterpreted as a sign that the pet is still alive. Contrary to what most people believe, a pet’s eyes do not close when they die. In addition, as their muscles relax, it is not uncommon for the pet to release their bladder and bowels. In anticipation of this, an absorbent pad will be placed under the animal prior to administering the final injection. On rare occasions, adverse reactions to the initial combination of drugs do occur, leading to a prolonged period of excitement. Animals that have had seizures in the past may experience seizures at this time as well. If the pet has ever had reactions to sedatives or anesthetics and/or seizures, please let us know so that we may be prepared. 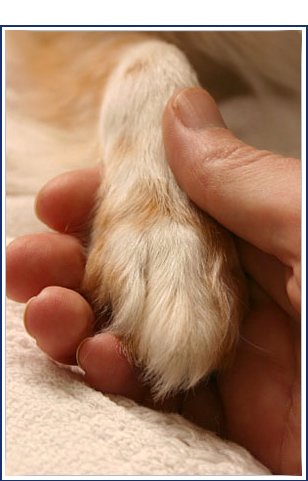 After the pet has peacefully passed on, those present may spend as much or as little time as desired with their pet. The body will either remain with the owner or be removed by Gift of Goodbye for transport to a crematory. Please go to Aftercare (Burial or Cremation) for more information.